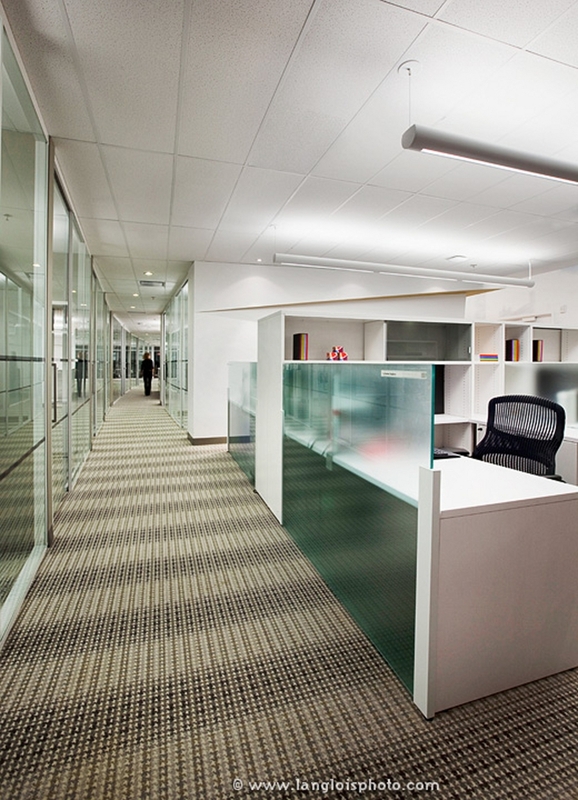 For the second year running, Montreal design firm id+s Design Solutions has won the Shaw Contract Group’s “Design is…“ international award for Innovative new space, this year, for the executive offices of Astral Media, located on the 27th floor of the Maison Astral building at 1800 McGill College in Montreal, Quebec. 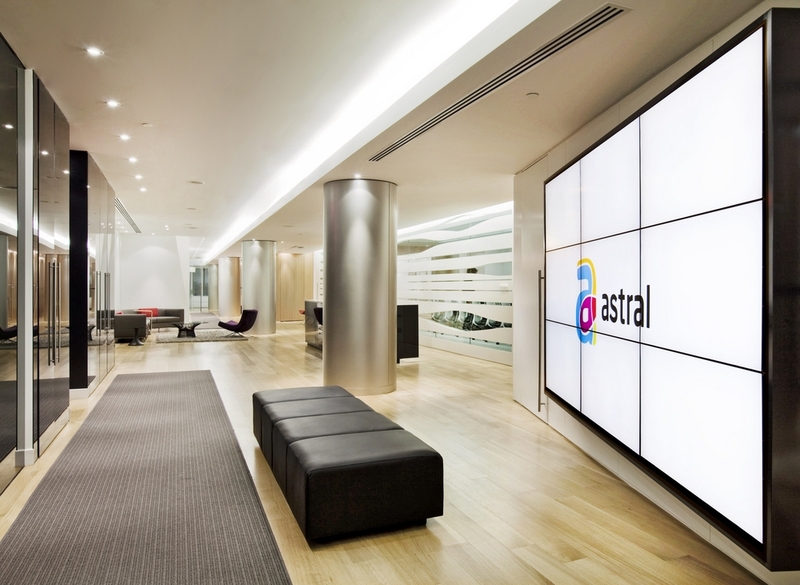 Astral is one of Canada’s largest media companies reaching people through a combination of targeted media properties in television, radio, out-of-home advertising and digital media. It traces its roots in media from Montreal’s Greenberg brothers who created a photography chain 50 years ago. Adopting a new brand identity reflecting the company’s new corporate profile and evolving culture, along with a move of their headquarters in the heart of downtown Montreal, required the 18,000 sq. ft. executive floor to be representative of this new vibrant culture and also reflective of the founder’s personality and wishes of a warm, comfortable and elegant workspace. Working hand in hand with the founder, exploring the middle ground to creating a space, a new home, representative of Astral today and its origins, made this a unique and memorable design process. 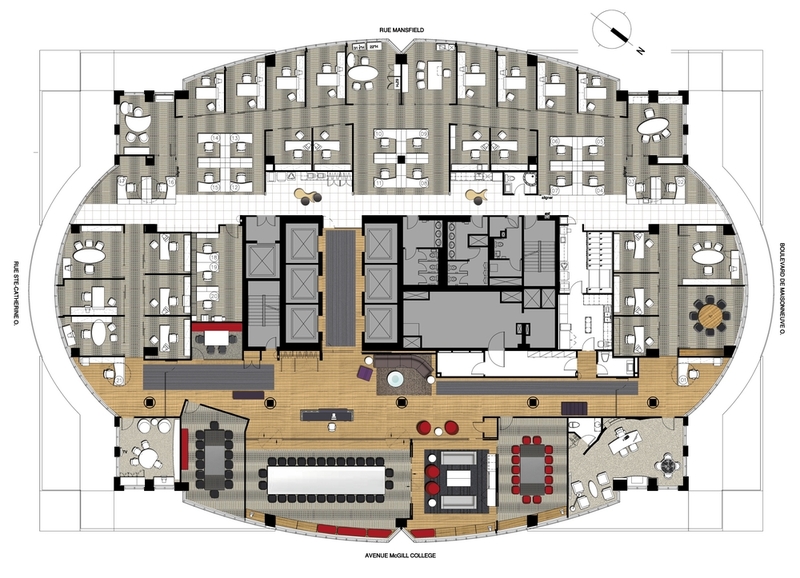 The design challenge was to create a warm, comfortable and “established” executive floor, amidst a highly modern media company identified on the other 5 floors. Reminiscent of finishes of the 80’s, introducing warm light oak wood flooring and panelling in big gestures throughout the space and contrasting it with crisp white walls and dark glass freshly simplifies yet, at the same time, warms the space. 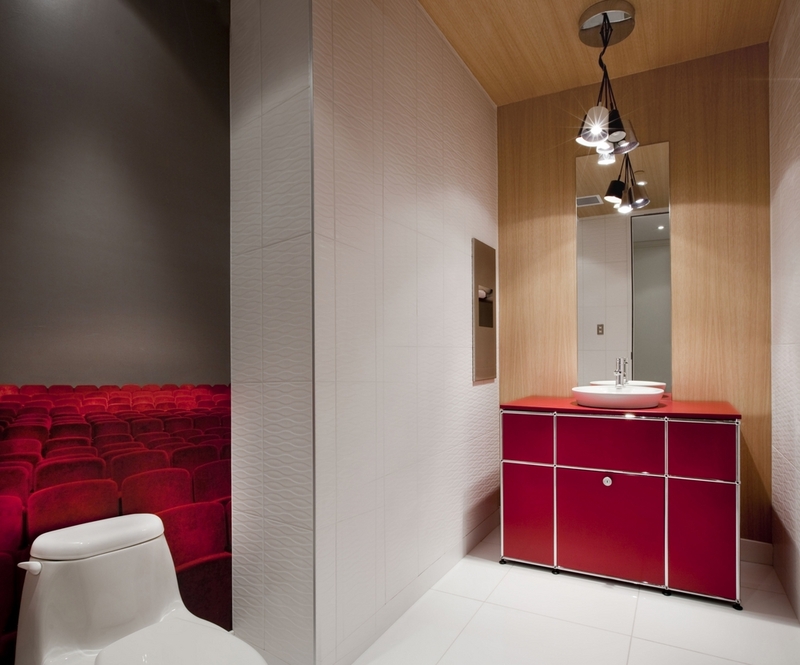 Red was used as an accent, not only because of its vibrancy, but also because it was a color that could be both contemporary and timeless. 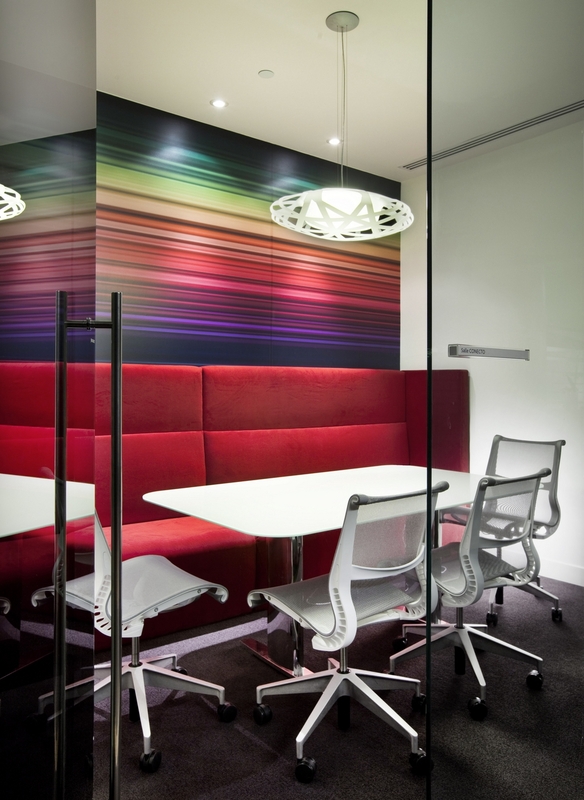 Graphic walls were introduced sparingly to inject color and whimsical humour to the space. 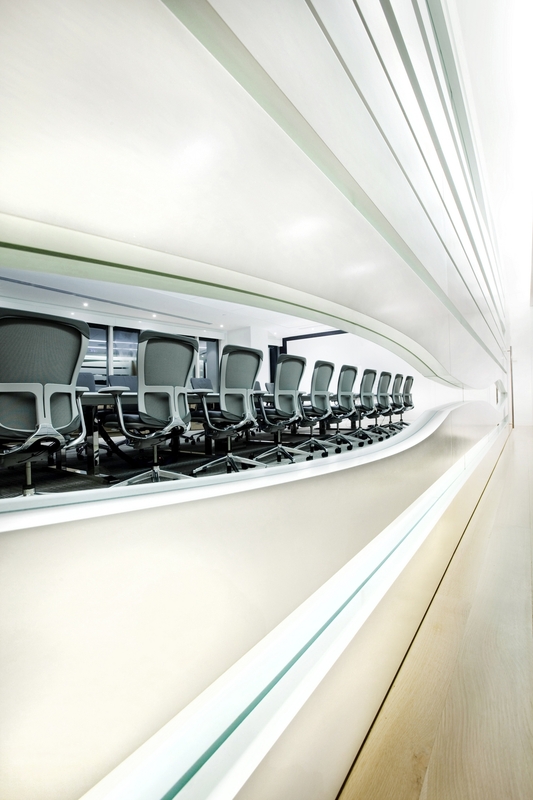 Because of space restraints of accommodating executive window offices and large conference rooms, achieving natural daylight into the reception while still providing visual privacy for the conference rooms was a design challenge. Having no access to the exterior windows and fully- glazed conference rooms not being an acceptable option for this client, created a narrow reception area. 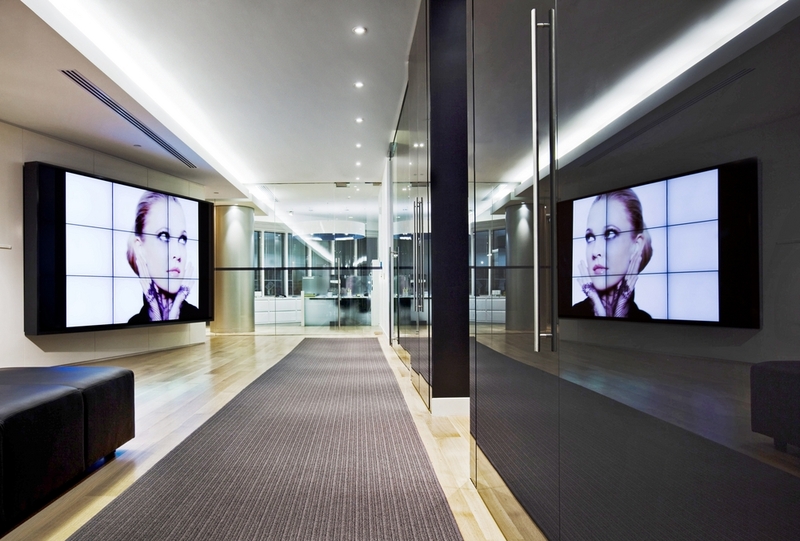 The solution to stretch the reception horizontally in reaching out to the windows of the executive work areas in both directions of the building was key to accessing light and perspectives. 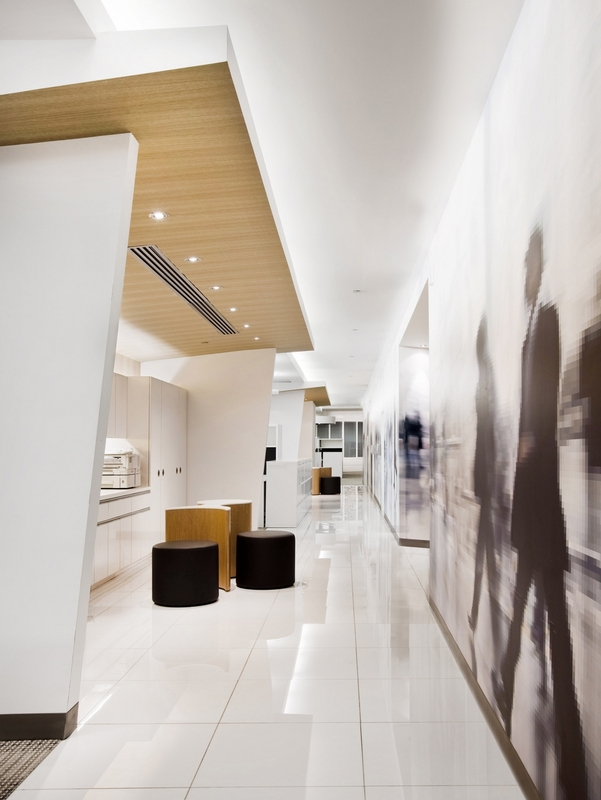 This horizontality emphasized by a “waved” feature wall serves as a backdrop to the reception desk and divides the reception area from the main boardroom allowing glimpses to daylight. During the brainstorming sessions with the employees, they unanimously agreed that the founder is a very jovial, approachable man and a “people-person”, but having to be disconnected geographically on the executive floor with his immediate team and conference rooms, was isolating him from the rest of his people. 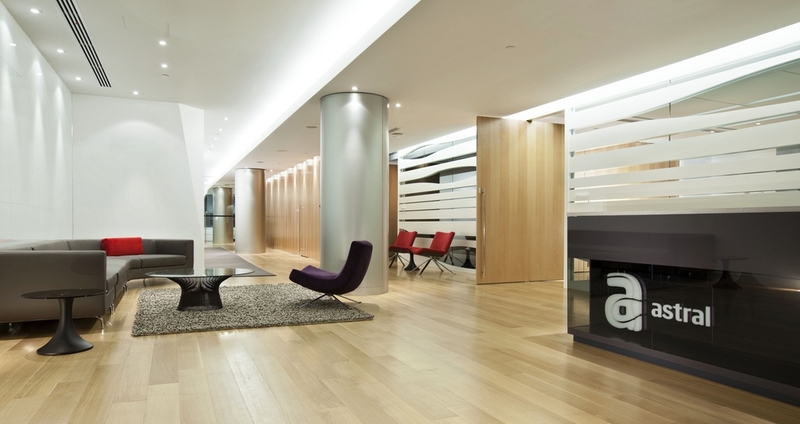 Today, his floor not only reflects his personality and the values and roots of the firm, but allows employees on all the other floors to know that they are warmly welcomed.